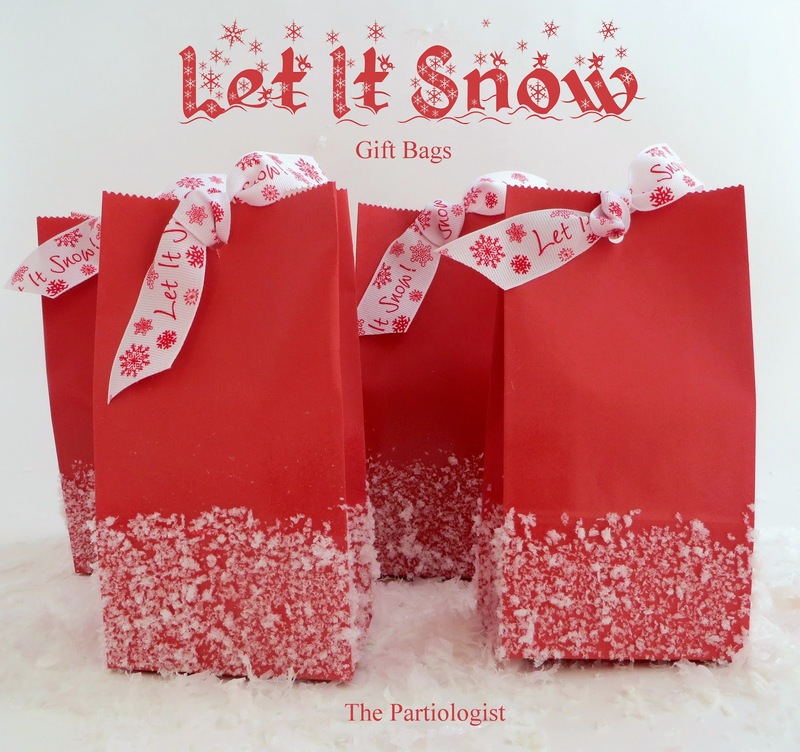 The Partiologist: DIY Snowflake Gift Bag! While the flakes are falling, I'll be warm in my kitchen making snow. Faux Snow. Okay, I really didn't make the faux snow, I bought it. I did, however, make the snowflake bags! With a few supplies, you can too! Spray the bottom of the bag with the adhesive (one side at a time) and sprinkle with the snow. Punch a hole in the top and add a Snowy Ribbon! Oh, don't forget to fill them with Snow Flake Popcorn Crunch! 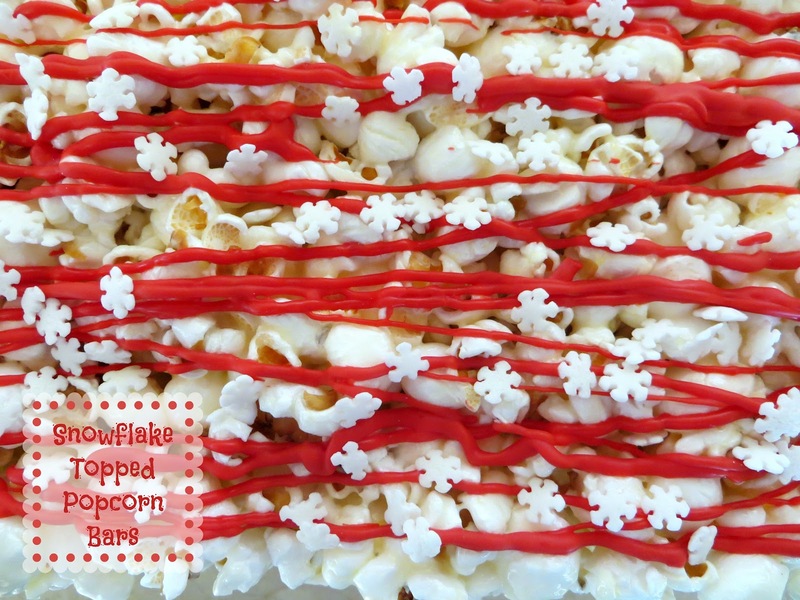 After making the popcorn bars, drizzle with red candy melts and sprinkle with snowflakes! Wrap with saran wrap before putting in the bags. Don't worry, they won't melt! Did you have a chance to enjoy mint chocolate coated non pareils during the holidays? I didn't. It's not too late and you can even make your own. I sprinkled red and white non pareils in the bottom of mini muffin tin. Top with a Dark Cocoa Mint Candy Melt and melt in warm oven for a few minutes - watch carefully! Let set until firm and you've got your mints! Now on to the box. My instructions?? Don't do it unless you only have a few to make! I ordered the tiny red boxes from Oriental Trading. After folding them open, I punched out a square and inserted clear plastic to cover the hole. 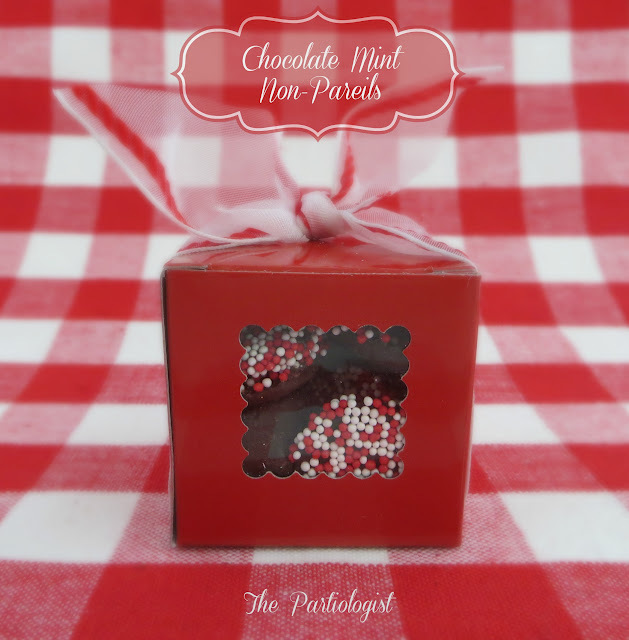 Allowing the cuteness of the chocolate mint non-pareils to show through it was worth the effort! I have to admit, I spilled a few of the non pareils - after I was finished! I adore those Let it Snow giftbags!! If you were my neighbor I'd bring some over...filled to the rim with goodies! These are so cute! I also love the mints they will be great for Valentine's day! Thanks! Loving all your treat ideas here but those snowflake bags are just adorable. Thanks Paula - I liked the way the bags turned out too! Fun bags and YUMMY popcorn treat. By the way, I love the font you used for Let it Snow! Thanks Tiffany - the font for Let it Snow is one off my computer word program, if you'd like I could find out the name of it. The chocolate mint non-pareils idea is genius - but I'm not surprised since YOU are a genius!! !